Divestment developed from a grassroots movement in the English-speaking world to a global campaign, which is being joined by more and more institutional investors, pension funds, cities and private investors. Even people who are initially not interested in joining this climate protection movement will be victims of divestment thinking because less and less money can be earned worldwide with fossil energies. There are many reasons for this: the prices and therefore the profits declined due to a growing range of renewable energies as well as overcapacities. Thus, investors and owners are getting nervous and committing themselves to climate protection goals, while governments are strengthening regulations and discussing taxes on carbon dioxide. According to a study by the Wuppertal Institute for Climate, Environment and Energy, these are the main reasons why the four big German energy groups are restructuring, selling business units and withdrawing from fossil and nuclear production as well as waste disposal, and are instead investing more heavily in renewable energies. The study also reports that these changes have nothing to do with the pressure of the divestment movement. Nevertheless, divestors are convincing more and more investors to withdraw from fossil investments with exactly these arguments. If the coal bubble bursts, it will lead to an economic crisis, compared to which the bank crisis in 2008 was a piece of cake. After all, private banks are the most committed players in the coal investment business. As a result, the propellant is leaking out of the coal bubble just as it did before due to the bankruptcy of Peabody Energy, the largest coal company worldwide. Even in the case of only a small divestment thorn, the long-term result is always a flat tire the investors cannot drive with anymore. With every rotation, the thorn may produce additional holes and therefore, divestment will develop into a global trend in the next five years – even if we think as much about the term as we did about sustainable development when it was introduced. This is why in this edition, all signs point to divestment, but we recommend investing in sustainability and education. Verena Kern explains the emergence of the divestment movement and its successes and Susanne Schwarz reports on municipalities that are parting with fossil investments as the windfall of the lignite regions has long been over. Susanne Götze summarizes how a carbon tax could help to enable necessary structural adjustments and how it already does so in some countries. Divested assets can do good by supporting the expansion of renewable energies, sustainable production and green building, as financial expert Susanne Bergius writes in her investment advice. Our photo story shows that the forest and forest investments play a special role in this. 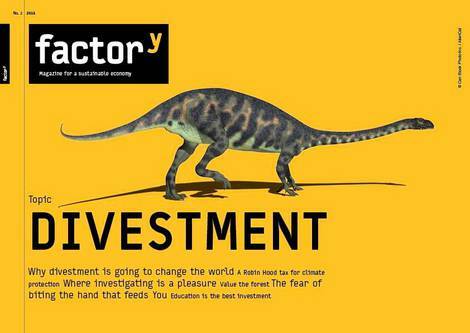 If countries reduce their subsidies and investments in fossil energies and instead invest in their educational systems, much more social prosperity can be achieved than with the promotion of the economic dinosaur of fossil fuel, as Manfred Ronzheimer concludes. The way ahead does not look dark anymore. Thanks again for translating factory to the classes of advanced students of translation under the guidance of Dr Donald Kiraly at the Johannes Gutenberg University of Mainz. Translated from the German by Lisa Caroline Rülcker, Tamara Reiser, Maj-Britt Kalusche Kaiko Lenhard and Anuja Phadke. 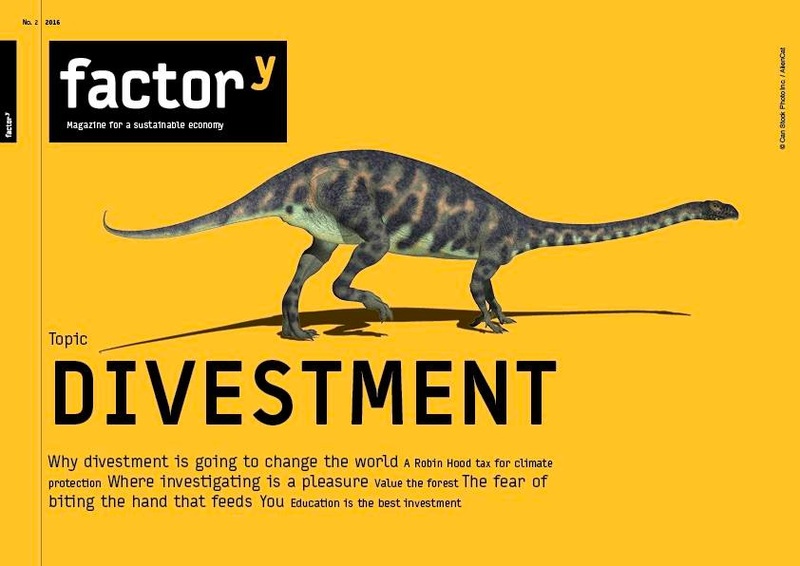 More articles to the topic of divestment, to stranded assets and to investments in renewable energies, in sustainable economy and in education there are not only online but in the factory magazine Divestment, which is ready to download. It is finely illustrated and good readable on tablets and screens and it contains all articles and pictures and even additional numbers and citations.